High Quality Content by WIKIPEDIA articles! 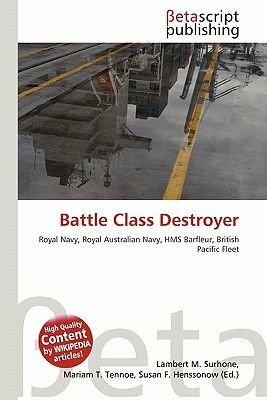 The Battle class were a class of destroyers of the British Royal Navy (RN) and Royal Australian Navy (RAN). Built in three groups, the first group were ordered under the 1942 naval estimates. A modified second and third group, together with two ships of an extended design were planned for the 1943 and 1944 estimates. Most of these ships were cancelled when it became apparent that the war was being won and the ships would not be required, although two ships of the third group, ordered for the RAN, were not cancelled and were subsequently completed in Australia.